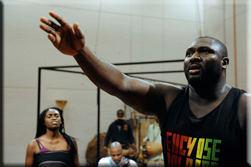 Nonso Anozie is a force to be reckoned with – literally. Standing at well over 6ft tall, the immensely talented and award winning actor has had starring roles in productions of Othello and King Lear and was the youngest actor to ever play King Lear in a professional production. He has also had roles in the films RocknRolla, Atonement and forthcoming BBC Film Occupation proving he has the ability to work across screen and stage. 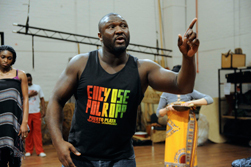 Amidst rehearsals for the National Theatre production of Death and the King’s Horseman by Wole Soyinka, he took some time out to talk with Afridiziak Theatre News about his remarkable career. You’re in rehearsals for Death and the King’s Horsemen. How’s it going? It’s been an amazing experience. I’ve worked here [The National Theatre] before with Kenneth Branagh in 2003, but this time to come here and do a play that is written by a Nigerian playwright. I’m also playing Elesin who is this Nigerian chief which is a great responsibility. When I was little I used to go to the library and there was this guy called Lord Eric and the Sugomoto, he was kind of like a story teller. He used to tell these stories and he would do it in such a way that would bring it to life and as soon as I read this script it just reminded me of that. What is Death and the King’s Horsemen about? It is set in Nigeria, which is a colony of Great Britannia, and is based on true events that happened but not exactly at the right time that they happened. When the king dies the tradition is that his horseman (Elesin) must commit ritual suicide to accompany him to the afterlife. He has to do this at a specific time, ordained by the cycle of the moon, so there is one night that he can do it and one night alone. The district office in charge hears about this and attempts to stop this ritual from happening as he can’t have anybody commit suicide. But the play is really about the two cultures colliding and what is going to happen if this guy succeeds in stopping Elesin. What attracted you to the character of Elesin? He’s got the greatest story within in the piece. I’m about telling stories and I really want to get my tongue around loads of words and engage an audience. Of all the parts in this play this is the one that stood out for me because he drives the story. You were the youngest person to play King Lear, was that a constant pressure for you? When we first got offered the job we weren’t told what parts we were going to play. So we had a period where we just did workshops so they could get a good sense of exactly how we worked. And then two weeks into it Declan [Donnellan, the director] said I want you to play King Lear and I was like ‘Wow...being at the RSC and on the Swan Stage’. But something about the way he works makes you comfortable with it because you feel like you’re all in the same boat, even though you’re the lead. Something about that has given me the confidence to go forward and dive into things, even when I have that initial fear. I read a quote that said “You have never been a struggling actor and probably never will be” is that true? Everybody goes through struggles. But in terms of struggling actor and lack of work, there hasn’t been for me. That’s partly due because I’m an unusual shape and size and ability which makes it easier for me to get into work. You are an award-winning actor, how do you feel about that? (Slight pause) I feel very, very blessed. Awards are great because people tend to look at you slightly differently but really if I can inspire somebody to get into this business or want do something or just make a change in their life that is much more important that an award. For example, the last film I did Cass, one young guy told me he changed his life as he used to walk around with a tool in his pocket but now he doesn’t and Cass was the tipping point to him doing that. In your Screen Nation Awards speech you said ‘To God be the glory.’ What role does God play in your life and career? A pivotal role. He is central to my life. I’m a Christian and I attend church every Sunday. I always put God first in whatever I do. Finally, what would you say is the key to your success? (Long pause) Faith in God and hard work! Info: Death and the King’s Horseman is on at the National Theatre until June 17. Interview with David Ajala who plays HRH The Prince in Death and the King’s Horseman.